So when I came across people buying sewn project bags, I figured: ah, I can do that! So I measured my favorite ziplock bag and made the bag to size. I've made quite a few so far, and sold about 10 of them as well. But a new idea has been lingering in my mind for a while, and that is to reuse old and worn clothes to make project bags out of them. I finally got around to it, and made one from my husband's favorite shirt and a pair of worn jeans of his. Now, I also have a couple of shirts to combine with new fabrics from a thrift store, that turned out too large for my husband. Would it be okay to use those for bags for sale? I'd really like your thoughts on this! I think they look great! I understand your thoughts, though. I don't see why you couldn't use shirts from the thrift store. Or hit up some yard sales. They look great! There are so many recycled things available now that I don't see why you would have a problem selling them. You don't have to say it's your husband's shirt, just recycled clothing. I think they are fabulous and as long as you say recycled it doesnt matter whose closet it came from. I think they are nice enough I would carry them as a purse especially if they had straps. Thanks, guys, that makes me feel better! I would make them larger as purses, but I cant figure out how to do the straps properly. I often think I'm a pretty good seamstress, but I can't seem to be able to figure out patterns without help, unfortunately. I just can't grasp sewing as well as I can crochet. And I've been sewing bags for years! I like them. the denim on the bottom looks good and seems like it would make it more sturdy. Probably a lot of people would like to buy something recycled/repurposed. Use the term "up cycled". That's the one I see these days. Don't be surprised if people ask if you will take commissions to make from their loved ones clothes. I don't see any problem with your idea. I have seen the term "re-purposed" frequently in the west and southwest here. Re-purposed denim is huge. Especially if it's termed with "Levi's" then spruced up with Swarovski crystals (glue on) or shiny brads. Good luck on your endeavor. 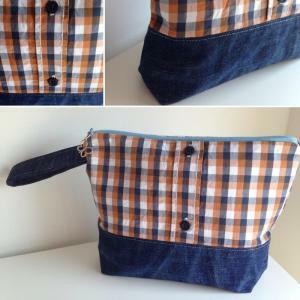 I've made denim purses and totes for 30 years out of old jeans. I began with my own old jeans, then began buying some at the second hand store. I use the legs to make long shoulder straps. Years ago, one of my sisters wanted a denim diaper bag. I bought the largest pair of second hand jeans I could find. They were huge! My sister loved the bag I made and it was sturdy enough that she used it through 3 children. 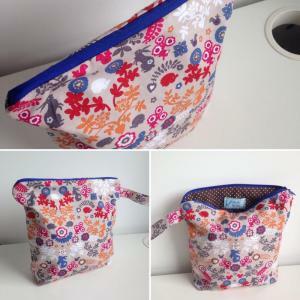 I love the idea of a sewn project bag and to recycle clothes into bags is perfect. Keep going! Pretty bags and good idea. Thanks, guys! I haven't made more of the shirt bags (yet), but I have been making lots of other bags, and I just got my first international order! (yay!) Not sure I'm allowed to post the link to my Etsy here, though. I think you can post link to your Etsy shop here. I have seen many other members done that with sales of their patterns & other stuff.. Yes, we would like to see your stuff in your Etsy shop:). Love your shop and your cute story! The Show and Tell area is not the appropriate place to post links to a business to try and sell stuff. I'm moving this over to the appropriate area of the site, since it's now become a thread with the purpose of promoting/selling your bags. Sorry for misleading info on the Etsy link. But is was not all misleading, the only problem it was posted in a wrong place. I did not knew about that. I did knew that I seen Etsy links in this group. I guess all of that it is little more complicated than I thought LOL. Thank you for moving it! I did not really intend to show off my shop, although I did want to do that at another time so this works well! I am currently trying to finish off my current stash of fabrics so I can start a new collection, so if you want the sale price you can send me a message.